THIS IS AN OPEN BOX ITEM. COMES WITH PACKAGING BUT IT HAS BEEN OPENED. MAJOR REDUCTION IN ROTATING MASS FOR INCREASED POWER TO THE REAR WHEEL. 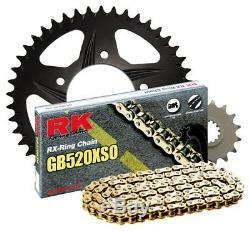 RK chain and sprocket kits are matched and balanced for maximum performance and durability that are unmatched by separate components. Each kit includes the correct grade and length RK O-ring chain and precision-matched sprockets to increase acceleration on modern sportbikes. 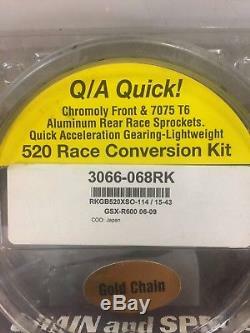 520 Race Conversion Kit contains: 15 tooth chromoly front sprocket; 43 tooth black 7075 T6 aluminum rear sprocket; RK GB520XSO-114 link gold chain. RK's new XSO chains offer quality, performance and unbeatable value for all; the most demanding high performance application. Viewed in cross-section, the RK RX-Ring has two lubrication pools and seal points versus the single seal point/pool design of a regular O-ring chain. All components of the MXZ4 chain are heat treated using RK's exclusive HIT (Heat Induction Transfer) process and include a clip type master link. Our number one goal is for you to be happy with your shopping experience. If for any reason you are displeased with your experience, please let us know so that we can make it right. These parts may fit other makes and models of varying years. Please find detailed terms of our policies below. Once in a while an item gets delayed while in the shippers hands. This happens so rarely in our experience, but in any case weve found that a majority of the time everything shows up at the proper location. We are a multi-line dealer in Boyertown, PA. We have been in business since 1996 and we have a staff of serious enthusiasts that are passionate about motorsports. We have been recognized by industry magazine Dealernews as one of the TOP 100 dealers in the US for the six years. We are also highly certified and accredited by Suzuki, Yamaha, and Triumph for our superior service and commitment to the customer. Plus, more recently Martin Motorsports has achieved Pro Yamaha status for the second year and will be Pro level as a Star Specialist as well. General Description of Our Operations. We are a full service, multi-line dealer that sells new and used motorcycles and ATVs. We carefully select each motorcycle/ ATV based on the parts we intend to sell individually. We only sell parts that are in working order and that we know have value based on their functionality. We will not attempt to sell broken parts, or misrepresent anything we sell. Liability arising out of or relating to the use or ownership of any. Of the terms stated above. That you have read and understand and agree to the terms above. 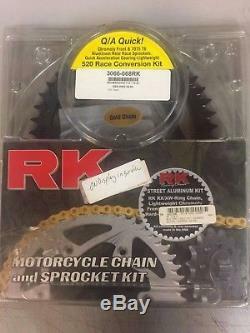 The item "2006-2009 GSX-R 600 520 CHAIN AND SPROCKET CONVERSION KIT" is in sale since Thursday, October 12, 2017. This item is in the category "eBay Motors\Parts & Accessories\Motorcycle Parts\Engines & Engine Parts\Other Engines & Engine Parts". The seller is "mmsparts" and is located in Boyertown, Pennsylvania. This item can be shipped worldwide.